Crape Myrtle trees are a favorite among gardeners, here in the South. You can hardly pass a house that doesn't have at least one in the yard. ...although some varieties are more like shrubs, these along our side yard are over 20 ft. high. 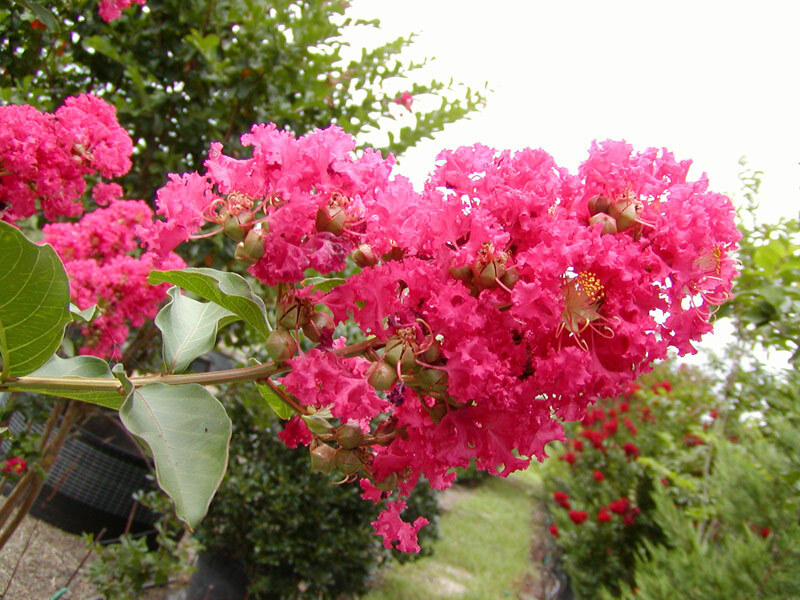 Crape Myrtles come in so many colors, it's hard to decide which is the prettiest. Here the homeowner chose three colors. These are miniature which grow about 3 feet high. Great in a raised bed. ...but one of my absolute favorites is Natchez. 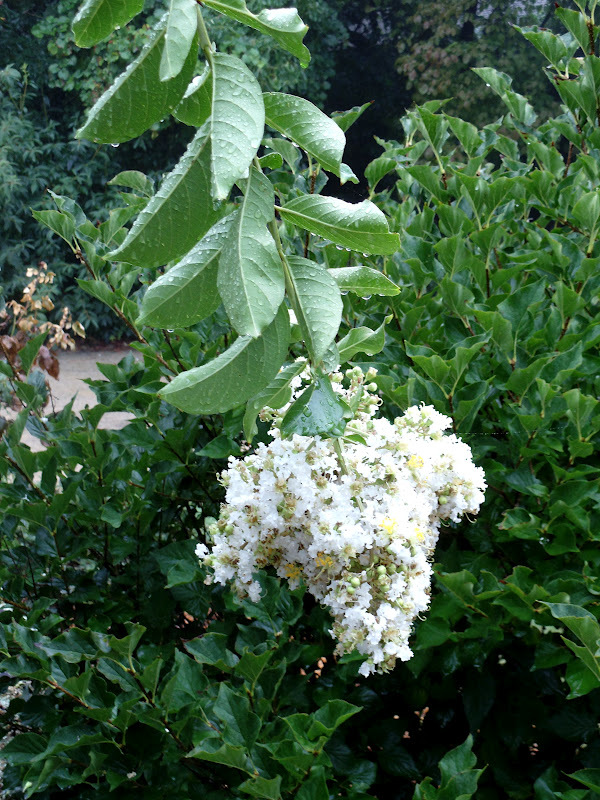 It's standard size with huge white blooms and grows to about 20ft. This one in our yard has only been here for 3 years, and is already 10 ft. high. ...and large white flower heads...drooping from the rain. ...and a gorgeous bi-color called Peppermint Lace. 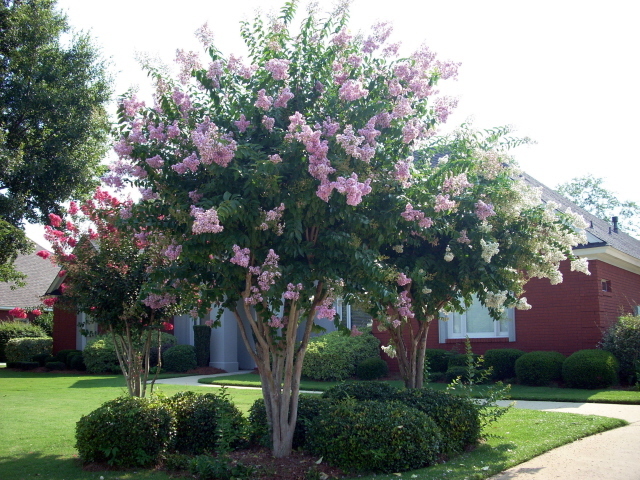 Do you love Crape Myrtles as much as I do? Do you have a favorite color? Babs, we don't have a crepe myrtle in our yard, but there are plenty in our neighborhood for us to enjoy. Yes, I do love this tree. It's the most amazing tree! They were planted along the highways here in TX because they are so hardy. They bloom all summer long in the extreme heat and without much water. They offer up beautiful color too! Oh, I just love crape myrtle! My friend has some in her yard in a bright yellow! Oh, so lovely! Those Crape Myrtles are absolutely fabulous. As far as I know we don't grow them here otherwise I'd certainly have some in my garden. Thank for introducing me to such a fantastic tree. 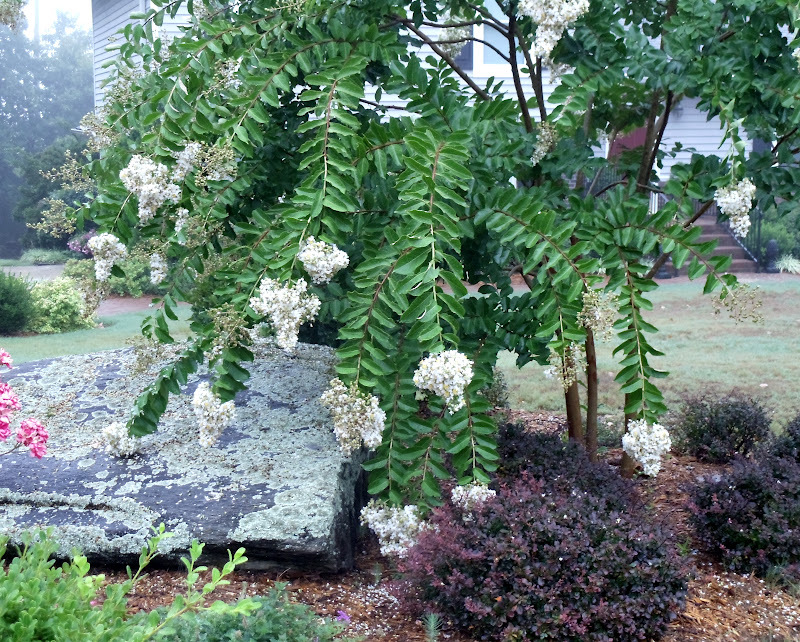 Wouldn't it be nice to grow Crepe Myrtle instead of flowering crabs, the most planted flowering tree in my neighborhood! These are fabulous photos of my favorite tree besides the magnolia. I have the miniature ones. The colors this year seemed to be so vibrant on the ones around here. They are so beautiful!! Barb, I do love them also! As a matter of fact, my husband and I planted two white ones in our front yard three years ago. They were tiny and they are about 12 feet tall now and full of blooms this year. I also have a smaller one on my flower bed with the hot pink flowers. We look forward every year to watch the flowers grow on these beautiful trees! Now, I had no idea that they came in that gorgeous Peppermint Lace color. I am going to have to research this because I would just looove to have one! Great post! I love Crape Myrtles and I finally have one at this house with the fushia looking flowers. I love them all but the bright pink are probably my favorite. We are starting to see them here on Long Island the last few years. I love them! Yours are beautiful! I definitely have to find a spot for one or three! Gorgeous specimens....ours are just beginning to bloom....my sister in law has a Dynamite Red one and it is spectacular....I love the Peppermint Lace! Baby, I love that red one it is Dynamite alright. We have several of the Natchez in our yard. Ours are struggling and are not blooming as normal.We are having such a drought here. We can't buy rain. I enjoyed looking at yours. I have got to research those yellow ones. That's a new one for me. Yours are gorgeous!!! Our neighbors On Crooked Creek have one directly across the street from us. Everytime we go in and out of the cul~de~sac we are greeted by its beauty! 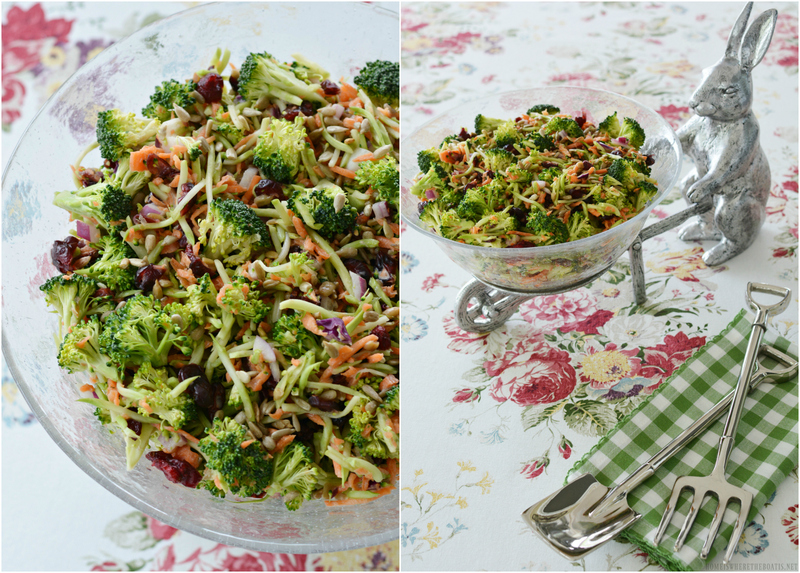 Thank you for sharing all the loveliness of this bush (on the Prairie) or tree (in the South! This is such a great post! You're right about Crepe Myrtles being popular in the south; once they're established, they can stand up to our hot temps. and long dry spells. My husband and I want to plant some as a screen across the back of our property. I think the Natchez variety looks perfect for our needs. The Peppermint Lace is a gorgeous variety! Thanks so much for visiting my blog and taking time to leave a comment. I hope you have a great week! Thanks for your visit and comment. I love crepe myrtles too, but don't have any. My daughter has both white and pink ones, and they are just full of blooms right now. I was thinking today that I need to go up and cut me a bouquet of them. Miss I want all the colors....red, pink, white not picky here. 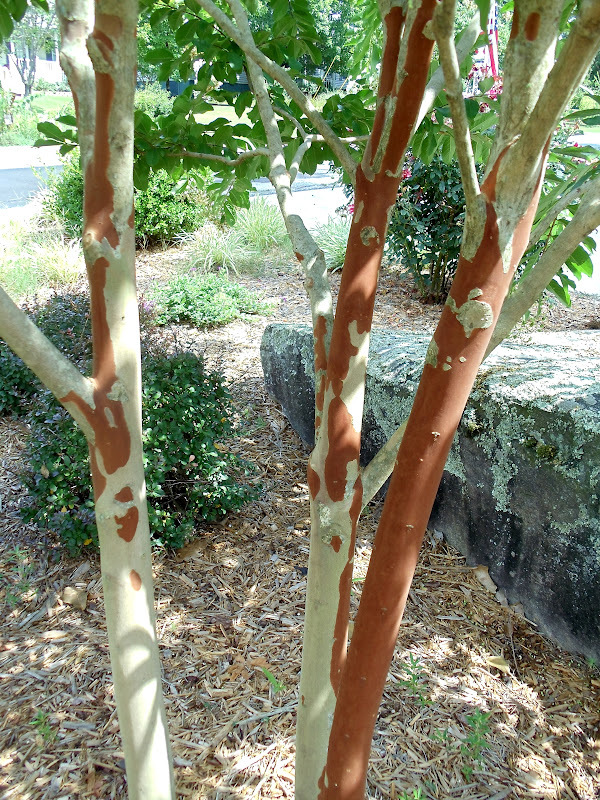 I don't believe I have ever seen a crepe myrtle up close because I think I would remember that tree bark. But who knows maybe I was so impressed with the blooms who would look down and see the trunk and the branches and the dirt when they are so radiant. great photos. All are gorgeous. 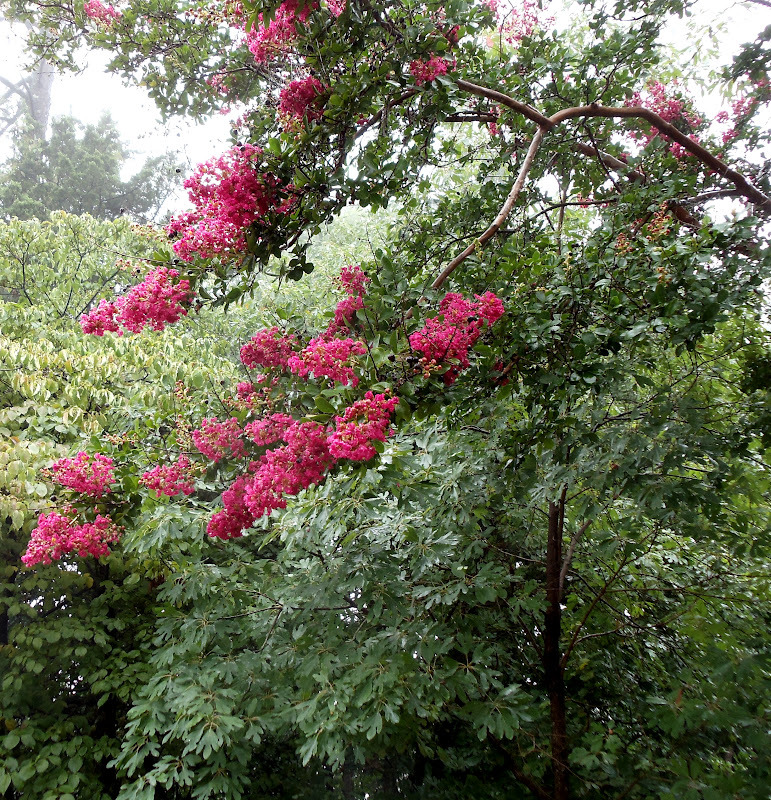 To me crepe myrtles simbolize strength, because they bloom in the mid summer. My favorite one is the last Peppermint lace, which I've never seen here in Osaka. What beautiful plants (trees?) I love the ones shaped up like trees. They die back to the ground each winter here, and then start over, so I never see any huge ones. Just wonderful. These are beautiful...love the photos and wonderful variety of color! I love crepe myrtles and miss them so much! I don't believe they would grow here in Iowa, but I remember them fondly growing up in OK and MS. Thanks for the beautiful photos!! Love Crape Myrtles! Have a whole row of them between my house and the neighbors. cut it back every other year!! Pink --- love that red and that pepermint lace! Daphne from Ivy, Phyllis and Me!These bushes are absolutely fabulous.....what a variety of colours. 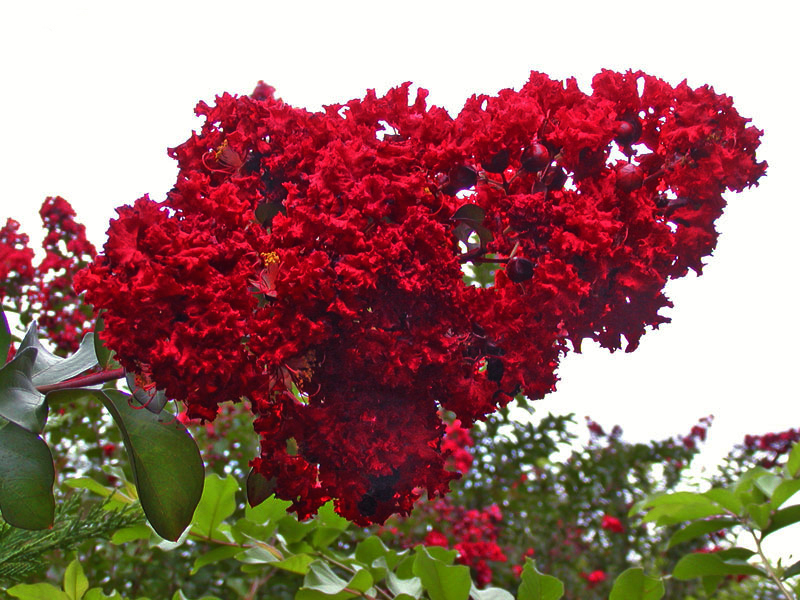 I have never heard of Crape Myrtles, but I will not forget them. My favourites are Dynamite Red....what an explosion of colour and the more delicate Peppermint Lace...sadly I don't think these can be grown in England. I will just have to enjoy your photographs. Best Wishes Daphne. Yours are beautiful! I love them, and they line the streets of my neighborhood and color it pink in the summer. They aren't as lovely and full as usual this year. I guess the drought of the past multiple years has been tough on them. I had never seen the miniature ones. I've got to try to get some of them. 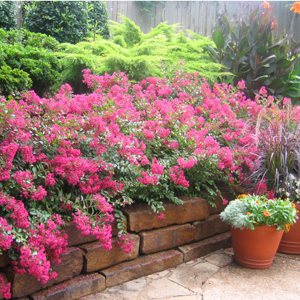 I love crape myrtle's too, my favorite is the dark pink. I have two by my garage in back of my home.